Gomer and Nene are graduates of TCM’s International Grace Bible Institute. Following their graduation in 1987, they served in a variety of ministries in the Philippines. They were actively involved in church planting and pastored a series of four churches, as well as engaging in campus and prison outreach and ministries to youth and children. Gomer also spent two years teaching in TCM’s Bible schools. The Indinos’ interest in outreach led them to take a missions course. They began to pray about entering into mission work themselves, and discovered that TCM’ Brazil field needed missionaries with church planting and theological training skills. Gomer and Nene believed the Lord was calling them to take up the challenge and go to Brazil as missionaries. In 1994, Gomer and Nene arrived in Brazil and immediately began language study. Brazil is the only Portuguese-speaking nation in South America. In addition to learning a new language, Gomer and Nene were plunged into cultural adjustments. After six months of formal Portuguese language instruction Gomer and Nene were able to enter into full-time ministry. Read the Indinos' December 2018 News! Click on Newsletter in the right sidebar to see their latest news and prayer and praise report. 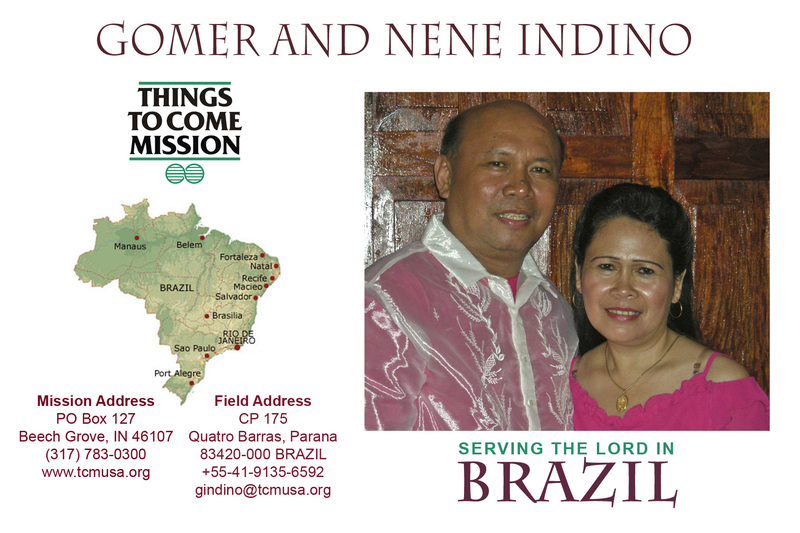 Gomer and Nene Indino have been serving with Things to Come Mission in Brazil for the past 14 years. The Indinos are eager to return to their ministry in Brazil at the end of 2008. They spent the past few months in their home country of the Philippines where they visited family, friends and churches and had the opportunity to participate in the 50th Anniversary celebration of TCM-Philippines. Their primary work involved theological training at TCM’s Bible school and working with the Brazilian churches. They also coordinated conferences and seminars for youth from all the churches in the region and led women’s & children’s ministries. When Gomer and Nene return to Brazil in December, they plan to resume working with their second church plant in the metropolitan area of Curitiba in southern Brazil. This fledgling church is the result of two and a half years of preparation and outreach. There are currently about 35 adults regularly attending the services, and 70 children come every Saturday for a Good News Club. The Indinos covet your prayers as they return to Brazil to nurture this growing young church, and look ahead to planting other churches. Though winter starts June 21, it is cold down here now. We are renting a small house at the seacoast so we can help training church members through evangelism and Bible studies, besides preaching and teaching in a small church which has no pastor yet. Since we arrived here December 2010, eight souls accepted the Lord Jesus Christ! Four of them are participating in the church services. One is about 80 yrs. old and only once failed to attend church services. Nene is training the women on How to Evangelize using The Four Spiritual Laws approach since it is already outlined and contains all the verses. The Church is now a bit revived, but still we beg your prayers since the church leader is 79 yrs. old and we are looking for someone who can be trained as Pastor for the church. May 14-15, 2011 - Mini Churches Conference in Ponta Grossa, Parana attended by about 50 people from different places in the states of Paraná and Santa Catarina. May 28, 2011 - Public Evangelistic Meeting in Shangri-la, Pontal do Paraná through the Young Peoples’ leadership and vision to win souls to Christ through testimonies, dramas, acrobatic presentation and of course, singing and preaching. The Young People´s organization name is REDE AO MAR (Net into the Sea). It was cold that night but 10 people accepted the Lord Jesus Christ! Two teens came to the Shangri-la Church service and one couple accepted to start the follow up through home Bible study. I (Gomer) and Nene gave orientation on evangelism a week before the above meeting. We will do this every last Saturday of the month. Pray for our Church Training Program going on now. Pray also for the Women’s Organization which was stopped four years ago, but now Nene is reorganizing and coordinating it through selected women in the churches. Saturday, June 4, 2011 was the Women’s Circuit Fellowship at Ilha do Mel (Honey Island). Nene was their speaker. September 23-25, 2011, will be our Churches Conference to be held in the State of Santa Catarina. We are looking forward for the coming of our TCM USA Director Ben Anderson as Guest Speaker. The churches are very excited and hoping it gives us more encouragement and challenges for the advancement of the Gospel of the Grace of God here in Southern Brazil. Please do continue to pray for us and for our health. Pray also for the Brazilian economic situation which is really hard for us, but also is a challenge to keep looking and trusting to Him who is the Provider of all things we need. Gasoline here went to $8/gallon, and now just lowered to $7/gallon due to continued US$ devaluation. Lastly, Thank You once again for your continued financial support and prayers for the Ministry here and for us personally. God bless us all.